Where am I? 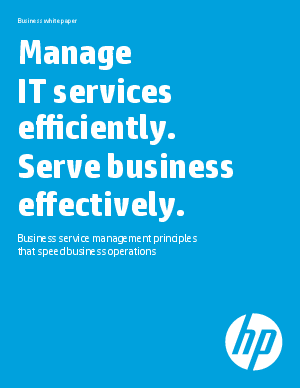 › Home > White Papers > HP - Enterprise > Manage IT Services Efficiently. Serve Business Effectively. Manage IT Services Efficiently. Serve Business Effectively. Many organizations are now moving parts of their IT infrastructure to the Cloud. However, managing these resources within a comprehensive management framework is still essential. And the management approach for these hybrid environments needs to take a step forward and start to focus on service level management, not the care and feeding of discrete components. This whitepaper provides the information needed on implementing Business Service Management (BSM) in hybrid environments.